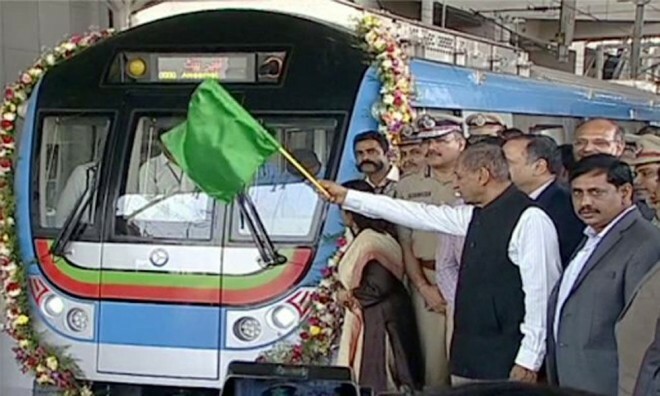 Hyderabad, Mar 20: Governor ESL Narasimhan on Wednesday flagged off Ameerpet-Hitec City metro stretch of Corridor III today around 9.15 am. As the election code was in place, the HMR decided to launch the services on the new line as a low-key affair. The metro services will be available to the passengers from 4 pm, said the metro officials. Speaking at the event, HMR managing director NVS Reddy said that the frequency of the metro train will be one for every 9-12 minutes. The 10-km stretch has around eight stations -- Madhura Nagar, Yousufguda, Road Number 5, Jubilee Hills, Jubilee Hills check post, Peddamma Temple, Madhapur, Durgam Cheruvu, Hitec City and Shilparamam.